Inspired by the Little Free libraries installed all over the world. Made from finding pieces – electrical cabinet, tin roofing, machine legs, and a milk crate shelf – and assembled with help from my father. Hand-painted with One-Shot enamel paints. All waterproofed and ready to go. Installation day for the Little Library! In what is coming to be an annual joy, I've managed to hand out over 400 books to kids during the Coopersburg, PA trick-or-treat night. It's a happy time, which both promotes the use of the Little Library, and gives kids and parents something to be excited about. I spend the year stockpiling children's and teen books, and just about run out of them each year. Gave away over 250 childrens' books in under two hours. 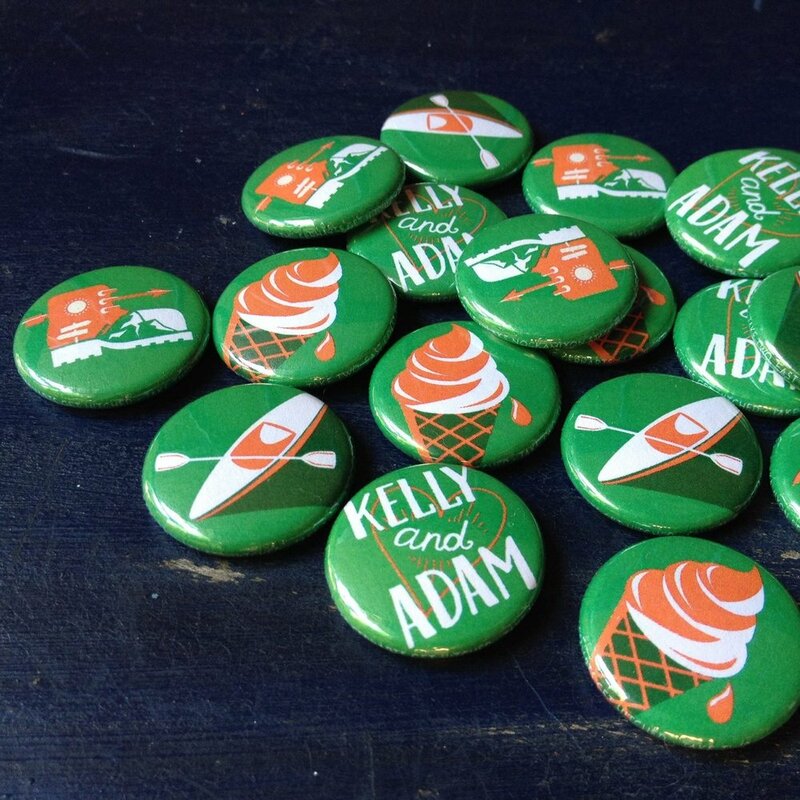 For my cousin's wedding at Lake Nockamixon State Park I created 1" souvenir buttons reflecting some of their passions – hiking, canoeing, and ice cream – and used Kelly green with a contrasting bright orange for Adam. The green cigar box was a lucky find at a cigar shop, and I painted the interior orange to match the pins and sign. Pin badge production by Lehigh Valley Apparel Creations. The bar became a London newspaper booth - complete with ‘Vote Saxon’ and Christmas posters recreated from the 2007 Christmas episode, ‘A Voyage of the Damned’. A white Christmas tree became a giant silver Dalek, with the donated items for the Center for Animal Health and Welfare and Turning Point LV stacked underneath. In other words, it was an out of this time and space party for Doctor Who fans to celebrate Christmas together. "I am and always will be the optimist, the hoper of far-flung hopes, the dreamer of improbable dreams." Quote typography poster made and framed as first prize to the best cos-play party attendee. Created from a white lit up Christmas tree, scrap cardboard, and found items from the dollar store. It was AWESOME. A poster created to decorate the bar decorated as a London newspaper booth, as from the 2007 Christmas episode, "A Voyage of the Damned". 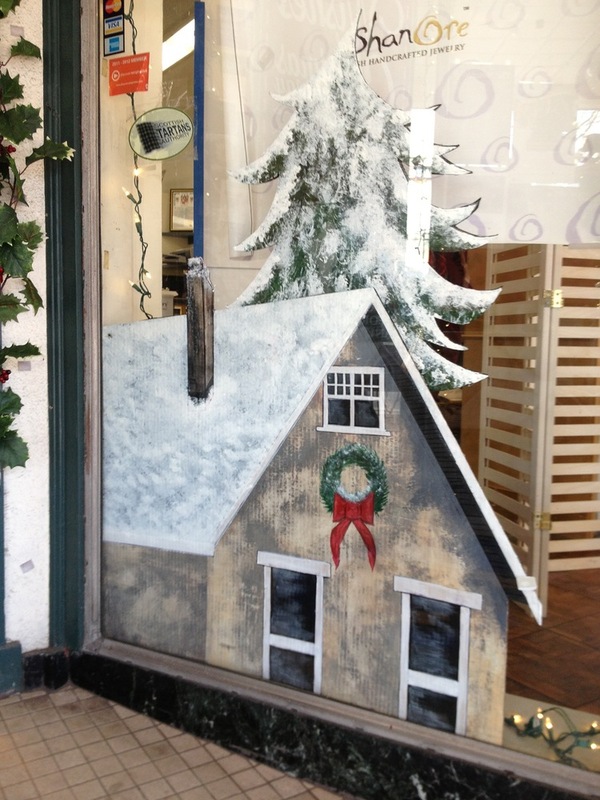 Created "Up on the Rooftop" Christmas shop display pieces for competing in the "Doors of Bethlehem" competition. All pieces made from found materials– scrap plywood, recovered sheets of cardboard, and shopped a flea market for the deer. • Final 'Kilted Santa' stands 4'5" tall. The Reindeer were recovered at a flea market, and were then reinforced, repainted and glittered. The Rooftops were drawn in perspective for Donegal Square's entrance, so that they would fit into the windows. 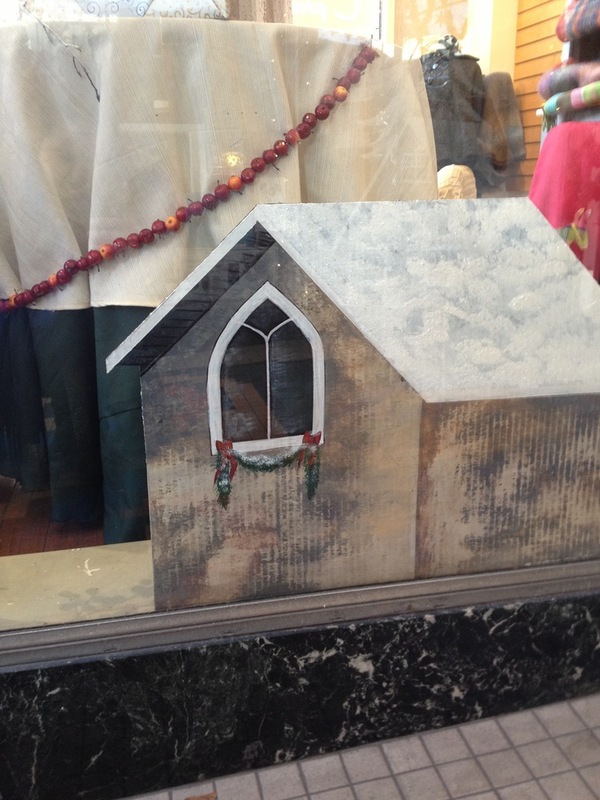 They were painted on cut-out cardboard, and coated in white glitter for the snow. The trees behind the houses are separate pieces, created the same way.